This article is about the acoustic phenomenon. For echoes in telecommunications, see Signal reflection. For other uses, see Echo (disambiguation). Clean signal, followed by different versions of echo. In audio signal processing and acoustics, echo is a reflection of sound that arrives at the listener with a delay after the direct sound. The delay is proportional to the distance of the reflecting surface from the source and the listener. Typical examples are the echo produced by the bottom of a well, by a building, or by the walls of an enclosed room and an empty room. A true echo is a single reflection of the sound source. The word echo derives from the Greek ἠχώ (ēchō), itself from ἦχος (ēchos), "sound". Echo in the folk story of Greek is a mountain nymph whose ability to speak was cursed, only able to repeat the last words anyone spoke to her. Some animals use echo for location sensing and navigation, such as cetaceans (dolphins and whales) and bats. Acoustic waves are reflected by walls or other hard surfaces, such as mountains and privacy fences. The reason of reflection may be explained as a discontinuity in the propagation medium. This can be heard when the reflection returns with sufficient magnitude and delay to be perceived distinctly. When sound, or the echo itself, is reflected multiple times from multiple surfaces, the echo is characterized as a reverberation. The human ear cannot distinguish echo from the original direct sound if the delay is less than 1/15 of a second. The velocity of sound in dry air is approximately 343 m/s at a temperature of 25 °C. Therefore, the reflecting object must be more than 17.2m from the sound source for echo to be perceived by a person located at the source. When a sound produces an echo in two seconds, the reflecting object is 343m away. In nature, canyon walls or rock cliffs facing water are the most common natural settings for hearing echoes. The strength of echo is frequently measured in dB sound pressure level (SPL) relative to the directly transmitted wave. 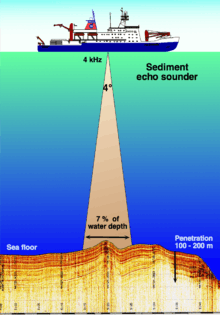 Echoes may be desirable (as in sonar) or undesirable (as in telephone systems). In music performance and recording, electric echo effects have been used since the 1950s. The Echoplex is a tape delay effect, first made in 1959 that recreates the sound of an acoustic echo. Designed by Mike Battle, the Echoplex set a standard for the effect in the 1960s and was used by most of the notable guitar players of the era; original Echoplexes are highly sought after. While Echoplexes were used heavily by guitar players (and the occasional bass player, such as Chuck Rainey, or trumpeter, such as Don Ellis), many recording studios also used the Echoplex. Beginning in the 1970s, Market built the solid-state Echoplex for Maestro. In the 2000s, most echo effects units use electronic or digital circuitry to recreate the echo effect. Whales echolocation organs, which produce echoes and receive sounds. Arrows illustrate the outgoing and incoming path of sound. Hamilton Mausoleum, Hamilton, South Lanarkshire, Scotland: Its high stone holds the record for the longest echo in the world, taking 15 seconds for the sound of a slammed door to decay. Gol Gumbaz of Bijapur, India: Any whisper, clap or sound gets echoed repeatedly. The echo in Chinon, France which is used in a traditional local rhyme. The gazebo of Napier Museum in Trivandrum, Kerala, India. ↑ Reviews, C. T. I. (2016-10-16). Conceptual Physical Science Explorations. Cram101 Textbook Reviews. ISBN 9781497092594. Wikimedia Commons has media related to Echo. More information on Chinon echo. 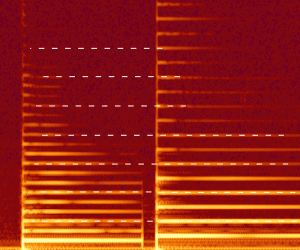 Listen to Duck echoes and an animated demonstration of how an echo is formed.